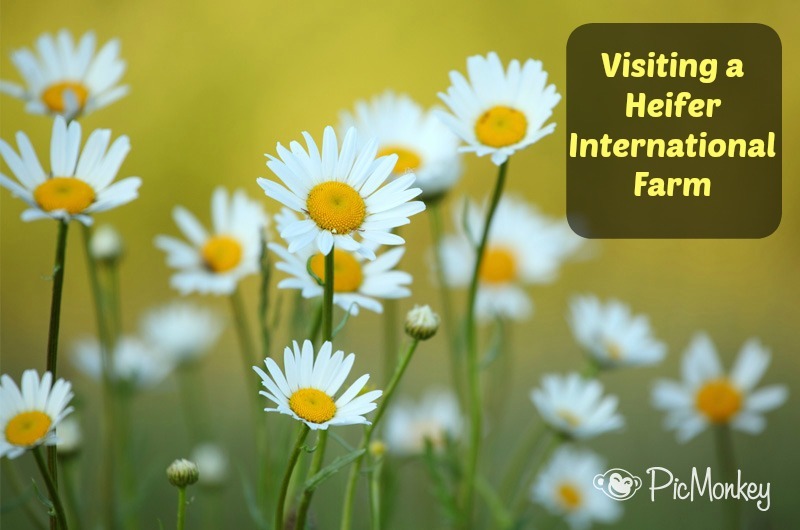 We were invited to go check out a local farm that is part of Heifer International today. Heifer international is a farm program that is designed to help end world hunger by sending live animals to poor countries, families, and areas in order to help them sustain themselves. After visiting a farm today and learning about their program I really just wanted to learn even more! You can too if you visit their webpage at Heifer International. There are 4 participating farms in the United States that are part of Heifer International and we are lucky enough to live near one of them. Overlook Farm is in Rutland, Mass and I have to say by the end of the day I was hooked and vowed we'd definitely head back there again. Overlook is free for all visitors (though school, church and I'm guessing even Homeschool groups, can all schedule more in- depth field trips to learn even more for a small fee per child). My sister and I were just planning to walk around with the boys and see the animals and tour the mini village they have set up, but we stumbled upon a woman at the front desk who offered to set us up with a quick 8 minute video about Heifer International and a few of the families and communities they help. She talked to the kids about how the organization works and we all learned so much. We learned that they ship cattle, chickens, bees, sheep, pigs, goats, worms, alpacas, etc. to families or organizations in need. Young, female animals are given as gifts so that they know the animals will live a long time, will be able to reproduce, and won't need added care that more mature females would need in shipping (like milking). We learned that there are 7 "m's" of giving--- by giving a community a live animal they are providing them with 1. Milk, 2. Meat, 3. Muscle (for plowing, planting, and transporting goods like a tractor in the United States) 4. Materials (making leather, or cloth from sheep/ alpaca fur) 5. Money (they can sell milk, eggs, etc. from the animals at a local store to get money for their families) 6. Manure (they can use manure to heat homes, cook food, and fertilize plants to grow better, more abundant crops, 7. (I can't remember the "m" word!!) but the 7th had to do with the empowerment the communities and families feel when they pass on the gift to other local needy families. Part of Heifer International's agreement is that the first young female born must be gifted off to another family so that they can prosper and sustain themselves as well. We learned that cows are always female, males are called bulls and when they are grazing together in a field they are called cattle. We watched a great video that showed a few of the children Heifer International has helped and followed them through their lives. One segment showed a girl in China who is in charge of feeding and walking her families goats and chickens. She harvests their foods, cook their meals and is now able to go to school since her family has saved a lot of money not having to buy expensive fertilizers anymore. She was not able to start school until she was 9 and works hard to catch up to her peers. The video only lasted 8 minutes but gave us a great sense of what their lives were like and how much Heifer International improved their standard of living. Watching the movie-- notice all the authentic artifacts around the room! After watching the video, we headed out to tour the barns and see the animals. We pet and fed hay to some of the animals before we headed into the village. Feeding the goats. The boys loved the baby goats too. Petting the sheep. We noticed some had been sheered and other had not. By far, my favorite part of the day was the global village. Set up along some paths in one area of the farm, the global village shows what houses, animals, crops/ gardens, etc. are like in various regions around the world where Heifer International has helped out. A display is in each house/ hut-- clothing from the area, toys, games, maps, brooms and tools. We learned that for just $20 we could set a family up with some chickens, ducks, or geese. They have tons of ways to donate and help out. If you are interested you can check out their many ways here. (NO, they don't pay me, but after talking with the boys and my husband we plan to help out one family with a flock of chicks). We pointed out the rain barrel to the boys outside this home in "Kenya"
We're now in Ghana in Africa. We learned about Slug farms! Back in the United States! We explained that even in our country there is poverty and families without food or adequate clothing and shelter. I had no idea that play existed! Googling it now to set up a trip, the boys would love it. My step father doesn't like receiving gifts for Christmas so we often donate money to charity in his name and have gone with heifer several times. They're an awesome organization.